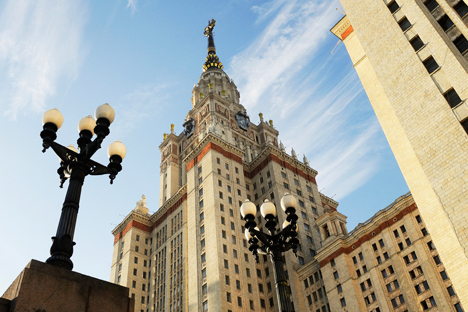 Moscow State University main building. MEPhI is ranked 36th for Physics in the Times Higher Education World Top 100 rankings. The National Research Nuclear University (MEPhI) jumped almost 60 places to get the 36th rank in the Times Higher Education World Top 100 Rankings for Excellence in the Physical Sciences for 2015-16. The university was in 95th place in the 2014-2015 rankings. The Lomonosov Moscow State University (MSU) and the Novosibirsk State University (NSU) also made it to the top 100 rankings this year. MSU fell from 56th to 59th rank from last year, while NSU dropped one place to 86th. The Universities of Oxford and Cambridge were the only non-U.S. institutions in the top 10. Earlier this year, the Russian Ministry of Education said that Russian universities would aim to rise in international subject-based rankings, rather than institutional ones. Being highly specialized, many Russian universities find it hard to rise in institutional rankings, since they are competing with Western universities, which tend to have many faculties.